Everybody's talking about it. 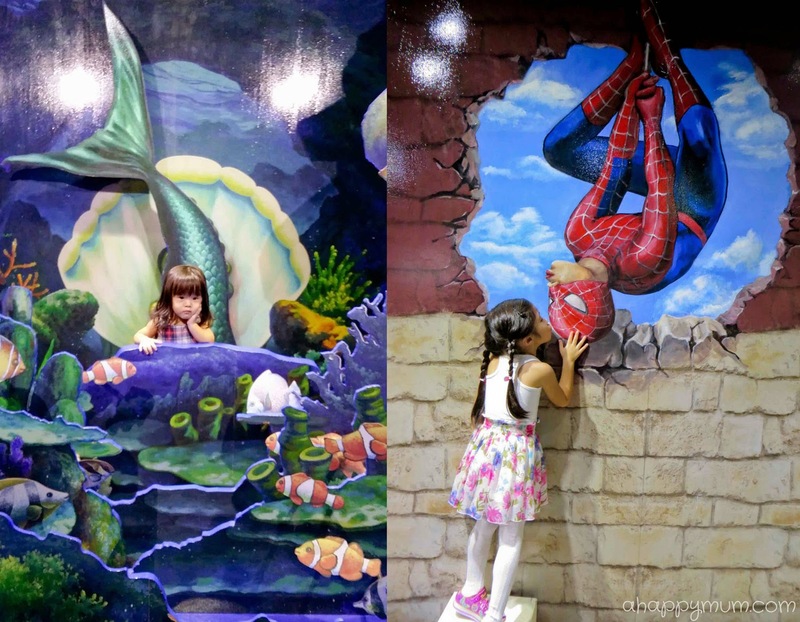 Be it Alive Museum or Trick Eye Museum, it seems like the 3D interactive illusionary art museum trend from Korea is fast catching up on our shore. 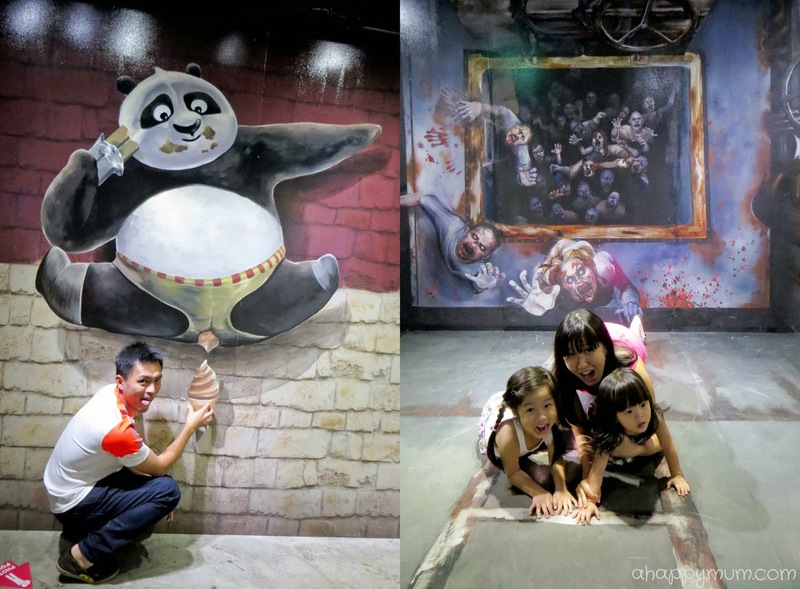 To join in the fun and have a feel of these unique and somewhat unconventional museums, we decided to check out what is touted as Singapore's brand new entertainment destination and the largest 3D visual illusion attraction - Alive Museum. 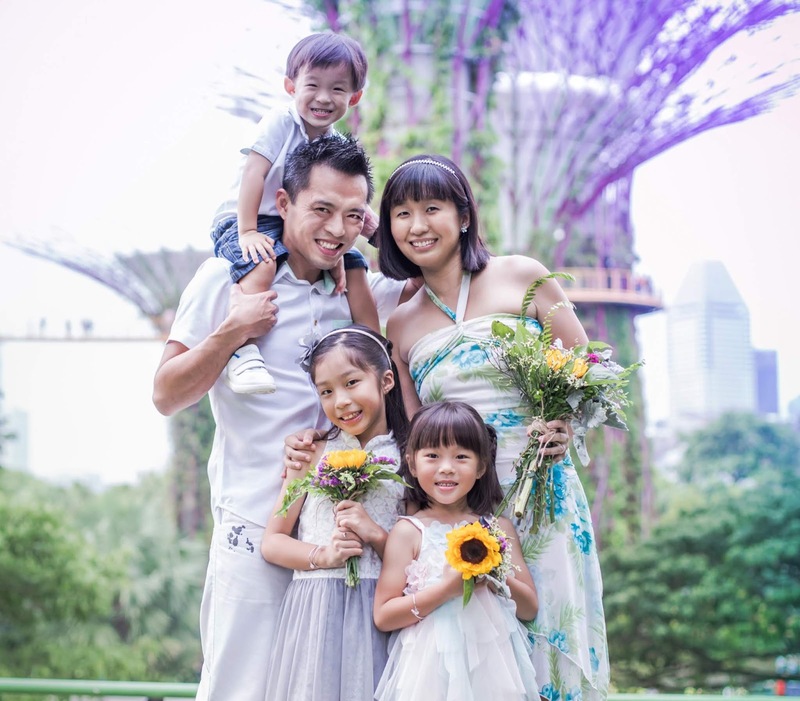 If you are planning an outing there with your family, here is A Happy Mum's guide including tips on how to make the most out of your visit there. 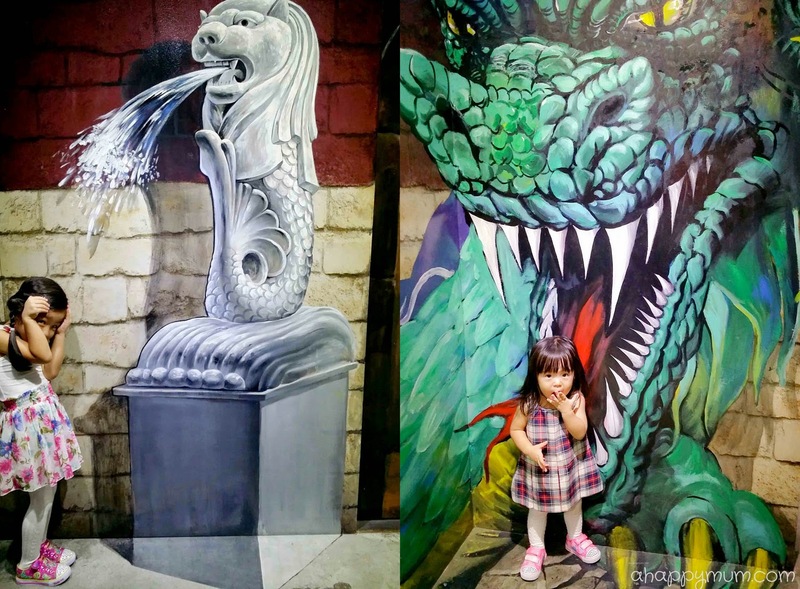 If you happen to be at Suntec City and are unsure of whether your kids will fancy this kind of museum, why not just hop over and let them take a look at the exhibits right outside? This way, they will have a better idea of the offerings and realise that this is not really a museum per se, but more of a fun place with paintings and props for them to do poses and take pictures. Left: A new candy flavour Right: Look! Meimei's frozen! Due to the need to get low, do weird poses and the presence of reflective surfaces in the museum, some people have advised against wearing dresses. However, as a mum with two girly girls and considering how a visit to Alive Musuem is all about taking pretty pictures, I decided to let them wear dresses and paired them up with leggings. Ensure that you feel comfortable in your choice of clothing and wear shoes that are good for climbing up and down. With the 10,000sq feet of space filled with over 80 art pieces, it would take you generally 1.5 hours to finish a tour. That is, not considering the fact that you might have sleepy, hungry, or lively kids who just can't stop running around. For me, I think a safe bet would be to have at least 2 hours to explore so that you do not have to rush through the exhibits and can take it leisurely while having as much fun as possible. Up and over the waves! Do try to avoid going on weekends as it can get pretty frustrating when you are armed with young kids and have to squeeze with the crowd or queue up for your turn at every photo point. If you can only spare time on weekends, then try to go early in the morning or late at night. Also, plan your visit such that the kids are fed, have had a good nap, are in the mood for action and all set to pose! You need some really strong muscles to lift me up! Right, this sounds pretty weird but you must understand that there are NO toilets in the museum! The nearest one is located right beside the entrance so do make sure you take the kids there first before you enter. Another weird thing is that Alive Museum does not allow patrons to re-enter once they exit. They are currently working on improving this system so just make sure that you have all you need, or emptied all that you don't want, before you make your way in. Now where do these stairs lead to? At every exhibit, there will be a corresponding arrow that indicates which is the best spot for you to take the picture. Although you can still find your own angles, make sure that the pictures end up looking believable. For instance, in the Singapore Flyer room, we made a mistake of not ensuring that the pole looked completely 'straight' so that made it look much less realistic when we reviewed our pictures. Unless there is not much of a crowd, if not you will have to wait patiently for a second turn to get the right angle. I realised that many of these 3D art effects are only apparent in the photographs, meaning even though you can't really tell on the spot, the pictures can turn out to look really awesome so don't be afraid to take more! Left: Handstand, easy peasy! Right: 来人, 看刀! Well, I refer to it both literally and metaphorically. For those of you who have long hair, do make use of it to make your photos look more real. For instance, in the dancer picture below, the hair made all the difference and made it looked much more natural and believable than if the hair had remained behind the painting. More importantly, don't be afraid to get crazy with your poses! It's all about being spontaneous and having fun, and people who are inside the museum are there for the same reasons. So just get wild, have fun, don't be shy and have lots of laughter in the trying process! I sense something long and soft, a trunk, of course! I think most of us would wish to capture our kids in that moment where they strike the perfect pose at the perfect angle and blend perfectly into that masterpiece. That moment might probably be one in thousand and once it is gone, it is unlikely to return again. 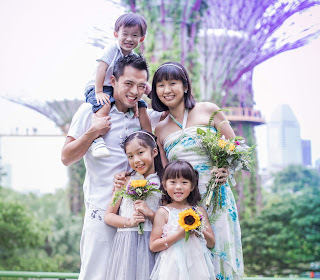 Instead of trying to coerce the kids into doing all the recommended poses or poses that we think look best, I actually feel it is better to let them do their own thing and sometimes, you might just end up with unexpected surprises. That said, I do feel glad that I have two kids who are mostly cooperative when taking pictures and would imitate our poses. Nonetheless, I do think they have their own thought processes and I like to see where their creativity and imagination can take them too! Left: Hair wash, anyone? Right: Mama, I thought ya said there are no dragons in the world. Let's see how long you can hang! Due to the tight spaces and the need to go through doors and corridors from zone to zone, it is not advisable to bring a pram or stroller when you visit Alive Museum. If you need to, a baby sling or carrier is more recommended. Also, since you only want people, not belongings, in the pictures, bring all your necessities in just one bag that is hopefully light and easy to carry around. If there is something you must definitely not forget, it is your camera! I find that a handful of the art pieces look good when taken with a phone camera, so don't forget to bring your phone too! Since there is free WiFi access in the museum, you can also upload the pictures and share with your friends on the spot. Left: Who's in the mood for some ice cream? Right: RUN! It's the Walking Dead! Left: I can do it too, MJ! Right: Thirsty for a drink? It's okay if you don't get to take picture with every exhibit. It's okay if there is a crowd and you have passers-by in some of your pictures. It's okay if your child acts up halfway and you have to reluctantly leave. Do what you can and leave the rest for a next time. If the kids are more interested in the interactive art exhibits and don't exactly feel like posing after you have asked kindly, let them be. If they are just happy running around, taking in the sights and feeling the sculptures, let them be. Shoot what you can and enjoy the time as a family. For parents with small children, do be warned that there is an exhibit called The Powder Room located near the exit that has a rating PG13. If your child wanders into it alone, well, just be careful that he/she doesn't get a scare. All in all, we had an awesome time as a family and we hope this set of tips will be useful to you too. Thanks to Alive Museum for the precious memories and fun-filled outing! 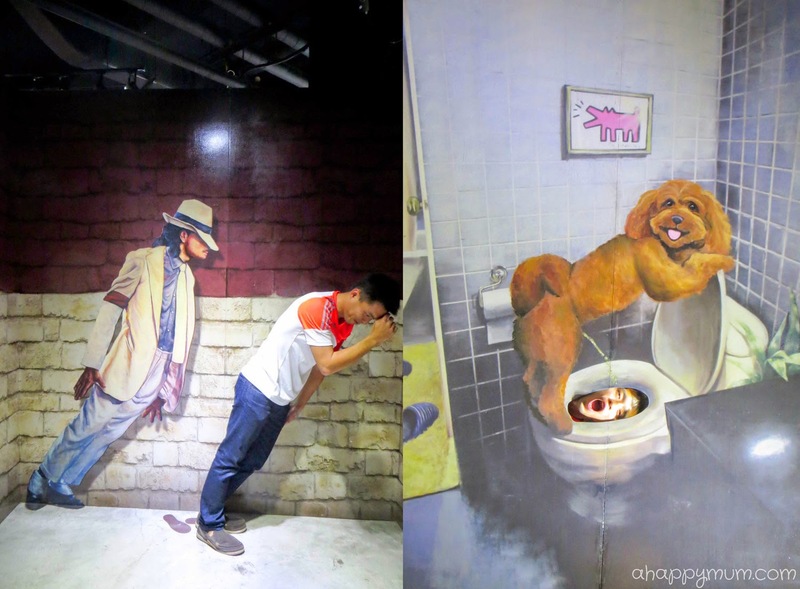 Alive Museum first started in Korea as Trick Art Museum in Seong-eup, Jeju Island, and changed its name to “Alive Museum” in 2012. Since then, there are 15 branches of Alive Museum globally, making it the largest chain of 3D interactive illusionary art museum in the world. 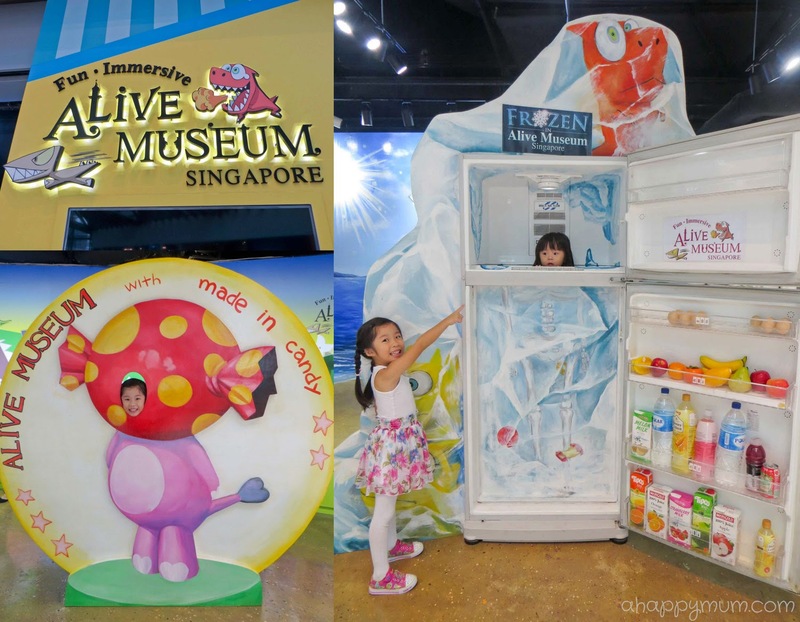 Outside South Korea, Alive Museum is also in Turkey, Vietnam, Thailand, China and now, in Singapore. 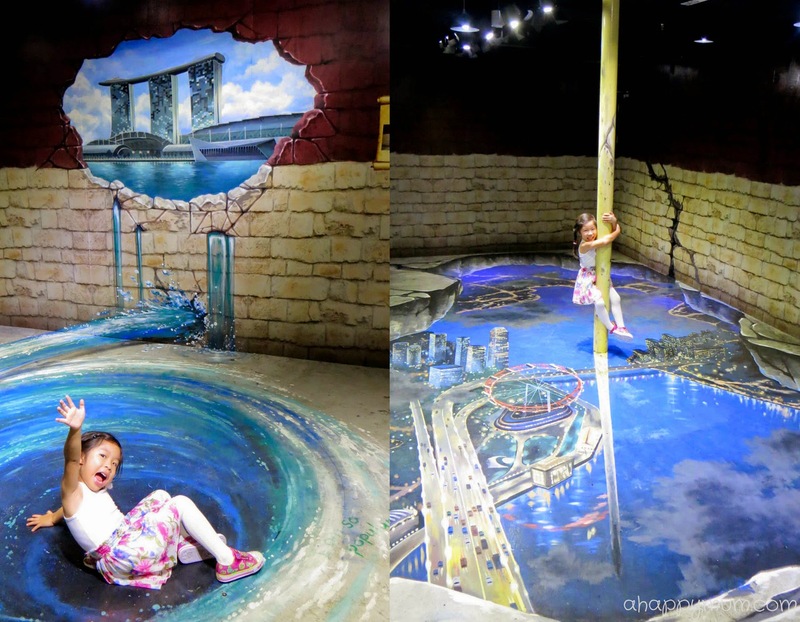 Currently, Alive Museum Singapore has over 80 artwork exhibits with 3D painting, shading and drawing techniques that create visual illusions. In addition to interactive pieces such as Marilyn Monroe and Mona Lisa, visitors will also see 9 locally themed paintings including Marina Bay Sands and Singapore Flyer. As part of their efforts to reinvigorate visitors’ experiences, 30% of paintings will be changed annually. *Book your tickets online now and use promotion code "aliveopen" at checkout to enjoy 20% discount. 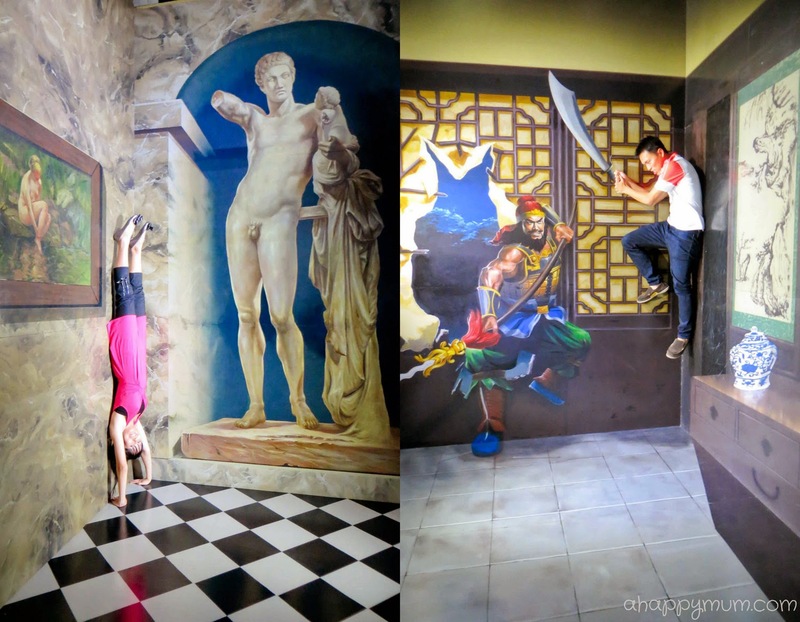 For more information, visit www.alivemuseum.sg. 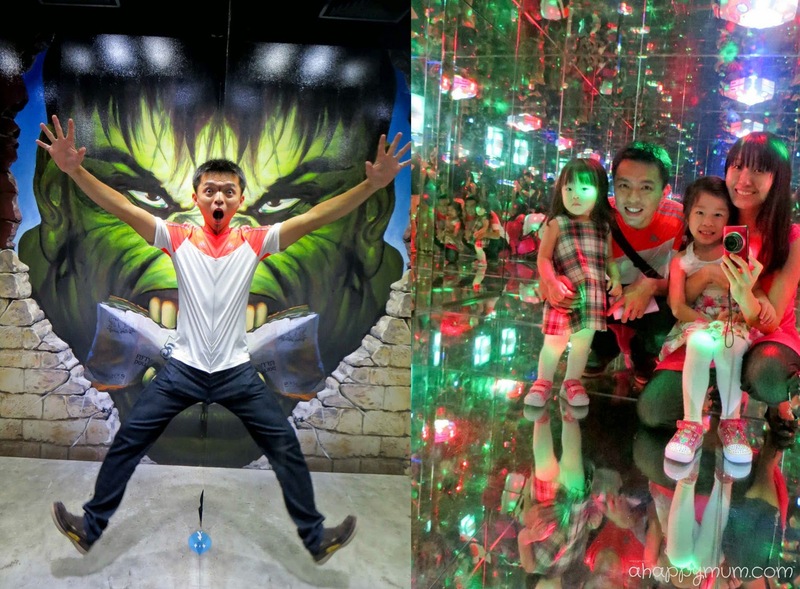 Disclosure: We were invited to visit Alive Museum Singapore for the purpose of this review. All opinions and images are our own.